With so many names, it seems hard to get it wrong. But when you hear someone say, "Ottawa Yard Jockey," it is like they're saying, "Ford Silverado." Ottawa is a brand and Yard Jockey is a model of another manufacturer. So when you put them together, it isn't quite right. It would be appropriate to call an Ottawa nearly everything on the list above. Imagine the finest Italian restaurant in town and compare it to Fazoli's. They both serve italian food, but that is where the similarity ends and the difference of quality begins. One restaurant gives you free breadsticks the other is an experience you will remember for a lifetime. One thing is for sure, Ottawa is the standard for yard trucks. It is the best brand, built with excellence, engineered for the rigorous day-to-day demand. In fact, Ottawa produces four times the number of yard trucks than its closest competitors. 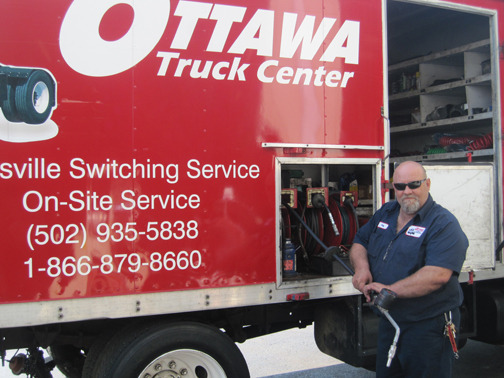 Louisville Switching is proud of the Ottawa brand, but we can help maintain any brand of spotter truck. With our Cummins-certified and Ottawa-certified mechanics, there isn't much we can't diagnose and fix. We are the experts and we thank you for putting your trust in us to maintain your fleet and supply you with the best yard truck in the business: Ottawa!